1.) 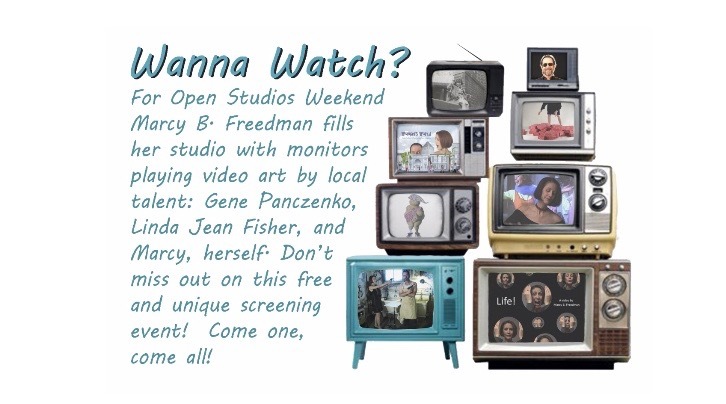 Jump into the mind of Westchester Artist and Art Historian Marcy B. Freedman as she presents works past and present at Peekskill Open Studio event on June 4 and 5 at her studio at 1006 Brown Street from noon to 5 p.m.
As promised, the countdown continues! Stop by and check out collages, photographs, sculptures and other visual media, including her videos “An Open Book” and “100 Reasons to Eat Something, which she worked on with other artists. Freedman, a Croton-on-Hudson resident, is also collaborating with other artists at a gala fundraiser by participating in group exhibitions and by presenting a public lecture. You can catch Freedman’s work at the Chashama Gala Fundraiser at 4 Times Square where she will present a new piece called Trust the Tiger. For an exhibition at SIA Gallery called The Art of Peekskill, she has re-worked old images to create a new work called Surveillance, which will be on view through June 12 at 1 South Division Street in Peekskill. Ten of Freedman’s digital works are also on display at the Katonah Museum Artists’ Association exhibition at Schoolhouse Theater Gallery, 3 Owens Rd. in Croton Falls through June 26. For the third day in a row, I am sharing an invitation with the public to meet a few of the 100 creatures (created by Marcy B. Freedman and Linda Jean Fisher) who will make their debut on June 4 and 5. You might remember Freedman as one of the 11 female artists currently featured in ArtsWestchester’s spring exhibit, SHE: Deconstructing Female Identity, who created a phenomenal performance piece that explores female identity through our clothing choices. You can check out Freedman’s “You Are What You Wear” exhibit through June 25 at The Exchange in White Plains through June 25. She’s the one holding the sign! She will also present an upcoming lecture OFFENSIVE: Images of Women in 20th Century Advertising on June 18 at the gallery. You can reach Marcy at (914) 271 5891, email to mbf@bestweb.net and see examples of her work at?marcybfreedman.com. 2.) While we love our significant others very much, no one can compare to your best friend. Your best friend loves you unconditionally, even when you’re a jerk. The relationship with your BFF is completely selfless and effortless. (lohud)?Striking Verizon Employees Back to Work Wed.